A comprehensive plan, covering all components, including inspecting the machine and documenting repair needs can help prolong the life of grounds equipment. Part two of a two part series. The equipment maintenence process should begin with a mechanic inspecting all component systems, documenting repair needs and creating work orders to address problems. A comprehensive plan for maintaining utility vehicles also should cover all components, beginning with inspecting the machine and documenting repair needs. The plan should cover all component systems and list needed repairs under each component. Using the maintenance manual, mechanics can prepare a component list. A typical utility vehicle list includes: wheels; steering; power takeoff, either manual or electric; the frame; the seat; axles; the deck lift; fenders; pedals; the fuel tank; the electrical and drive systems; the mowing deck; the transmission; and the engine. Some vehicle components, such as the fenders, generally need only cleaning and inspection to remove debris. Other components, such as transmission and engine, might need just oil changes or major overhauls. The deck will always need cleaning, inspection, tightening, and blade sharpening, and rarely — if the area is cleared of debris before mowing — bent shaft replacement. Besides topping off and changing oil, greasing, sharpening blades, and adjusting and tightening where needed, the spark plugs need attention at regular intervals. The mechanic should clean them to remove ash from the fuel- combustion process, then gauge and reset them using the appropriate feeler gauge. The service manual lists gauge size and frequency. Plugs set to the proper gap will burn fuel more efficiently, reduce vibration, and prevent the loosening of parts. Cut enough. Crews should avoid long intervals between mowing, which can force them cutting too much grass at a time. This is an especially large problem in the spring when several cuts a week might be needed. Setting the blade to cut only half the grass height at a time prevents clogging the mower deck, poor performance, and stalling. The right stuff. Use the correct mower for the job. Operators should use equipment with wider blades or multiple blades for large, open lawns. They also should use mulching attachments the ensure a professional lawn look, as well as side discharge for collecting grass and leaves. They also can use a sickle bar for hilly terrain, high weeds, roadside drainage ditches. Ask for help. 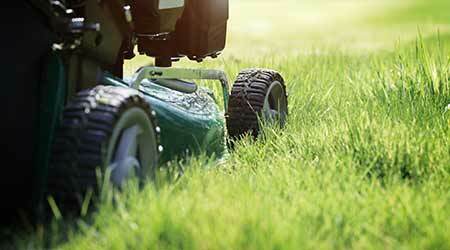 Do not wait too long to seek expert help with problems related to mowing equipment. Prolonging bad performance can cause major damage and expensive repairs. Operators and mechanics also can learn helpful tips by observing the expert’s troubleshooting and repair methods. Thomas A. Westerkamp is a maintenance and engineering management consultant and president of the work management division of Westerkamp Group LLC, www.westerkampgroup.com.